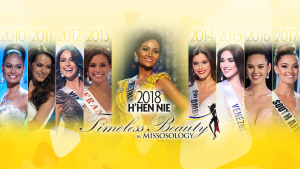 Home Miss Universe Featured Article OPINION :: When will Greenland come back? OPINION :: When will Greenland come back? Greenland – Grønland in Danish and Kalaallit Nunaat in Greenlandic – is a desolate yet beautiful nation, untamed, cold and isolated. It is the home of a little over 56, 000 souls where a few Caucasians mingle with local Greenlanders whose origins are the same with that of Eskimos in Alaska. For centuries, Greenland is a colony of Scandinavian nations of Norway and Denmark but lately, Greenland is asserting more and more for independence. It is currently a self-governing dependency of Denmark. Its foreign affairs and monetary policy is decided in far away Copenhagen yet it is not a part of the European Union. Almost everybody in Greenland can speak Danish yet there is a concerted effort to elevate the local Greenlandic language called Kalaallisut. Our story will begin in 1987 when the first ever Miss Greenland contest was held. But what prompted this contest and subsequently the country’s participation at Miss Universe? Well, two years ago in 1985, something changed politically in Greenland. As part of Denmark, Greenland automatically became a part of the European Union then named as European Economic Community in 1972. But because the ECC policies ran into conflict with many Greenlandic traditions like the ECC’s fishing policies, Greenland demanded home rule in 1979 and in 1985 decided to leave the ECC. With the political winds blowing in favor of less dependence from Copenhagen, Greenland decided to flaunt its new found freedom by participating at Miss Universe in 1987. The debut of Greenland at Miss Universe was not really remarkable. In 1987, the Miss Universe pageant was held in Singapore. Miss Greenland Susse Petersen was ranked at the bottom half of the swimsuit scores and interestingly one rank below Miss Denmark Nanna Louisa Johansson. In 1988, the pageant was once again held in East Asia and this time in Taipei, Taiwan. Nuno Nette Baadh carried the Greenlandic flag and she was ranked somewhere in the middle at swimsuit preliminaries. Miss Universe 1989 went for a Latin American flavor by choosing Cancun, Mexico as the host city. No one really knows by now on what is the rank of Miss Greenland Naja-Rie Sorensen. It was pageant that was won by Angela Visser of the Netherlands. Then in 1990 came the finale of Greenland’s participation at Miss Universe. The pageant was held in Bangkok, Thailand. A Scandinavian won in the name of Mona Grundt of Norway. The year 1990 marks the highest placement of Greenland at Miss Universe. 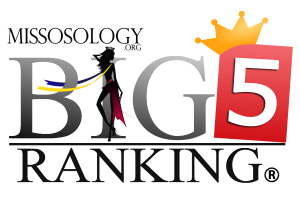 If the system that was used then was the same system that was used in Miss Universe 2006, there could have been a Greenlandic Miss Universe semifinalist. Unfortunately, there were only 10 semifinalists that were chosen. Thus, Miss Greenland 1990 Sascha Nukaka Motzfeldt can be hailed as the best Miss Greenland ever by placing 19th at Miss Universe 1990. For some reason, Greenland left Miss Universe in 1991. It’s a bit perplexing because the country was by then doing well at the pageant. Missosology is unable to ascertain on what happened in 1991. Was it a change in franchise holder? Was it about the franchise fee with Miss World asking for less than Miss Universe? Whatever happened, it came to pass that Greenland debuted at Miss World. 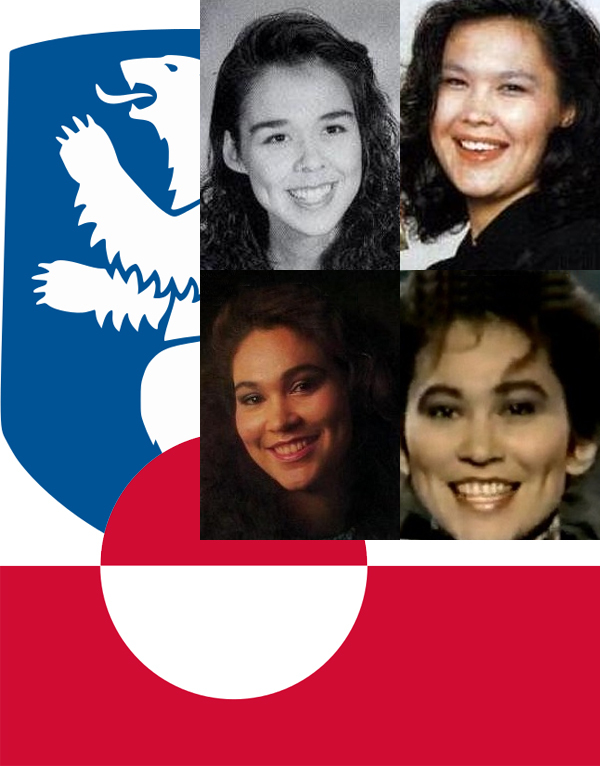 Bibiane Holm from Nuuk, then called at Godthab, carried the Greenlandic flag at Miss World 1991 held in Atlanta, USA. Bibiane who described herself as an 18 year old student fits into the description of a sweet beauty that Miss World is looking for. Unfortunately, Bibiane missed the semis berth. Ninibeth Leal of Venezuela won. The last time Greenland participated in a major international pageant was in 1992. Laali Lyberth represented the dependency and for the first time in the pageantry world, Greenland’s red and white flag was shown albeit in a few seconds. Perhaps so few people knew at that time that as the Greenland’s flag was flashed on the screen to the worldwide audience, the nation was actually bidding goodbye. The Miss Greenland contest was officially folded in 1992 and it was a reason unknown to Missosology. Perhaps the economic side of participating was too costly considering that Greenland was pretty much isolated even today. Or perhaps because the interest in pageantry at the nation is quite low? Attempts to put Greenland back at the pageantry map had been made although not at the Big4 Pageants. In 2010, Lisa Renee Winther Kristensen represented Greenland at the Miss Civilization of the World contest held in Turkey. Lisa created an uproar after it was found out that she was not from Greenland and had never set foot on the large Island. She was actually a Danish lingerie model. “I think it is nonsense that a person who has never been to Greenland will represent the country in this way,” said the leader of the Greenlander protesters, Ivalu Martinsen Egede to Greenland Radio. It was an issue that Greenlandic people see as an attempt to suppress their identity and to misrepresent them in the international community. The Greenlanders expressed their opposition by signing up in Facebook page protesting Lisa’s participation. The current political situation in Greenland is setting a trend towards independence. In 2008, the nation has affirmed its self-governing status. Denmark continues to subsidize the large island but recently, Greenland allowed uranium and rare earths mining paving way for a much higher revenue collection. This will allow the country to lessen its dependence on Copenhagen. If one day Greenland decides to become independent, it must make its mark in the pageantry world by participating in Miss Universe, Miss World, Miss International and Miss Earth. It may not be significant to some people but as the Greenlandic National Anthem goes Taqilluni naami atunngiveqaaq, kalaallit siumut makigitsi. In pageantry world it means that being demure is not the Greenlandic strategy but rather, the nation must wake up and be fierce!